First published in Mediapart. Translated by David Broder. The French government’s violent destruction of the commons at the Notre-Dame-des-Landes ZAD ["area to be defended"; an occupied territory which authorities had formerly earmarked for an airport] is a shameful, revolting act. The current police offensive, waged by thousands of armed police and CRS riot cops with armoured cars and helicopters, is the purest of state violence. This violence is being deployed against a set of collective practices — whether embryonic, or already-existing — whose fragile material conditions (their buildings, meeting rooms, work tools, herds) have been wiped out by bulldozers and police squads. On the first day of the onslaught against the ZAD in Notre-Dame-des-Landes, the destruction of the 100 Names farm constituted an authentic declaration of social and political war. The destruction of this site was not at all determined by the criteria invoked by the government’s "statement." Nicole Klein, police prefect of the Pays de Loire, justified the police operation by claiming that 100 Names had not submitted any agricultural project. This is evidently false: this farm’s inhabitants support an alternative agricultural project and some of them had indeed made applications for regularisation. What is the real motive behind this destructive frenzy? What is in question, here, is not whether a project exists or not, but the nature of the plans concerned. What the state and its representatives cannot bear is the fact that for ten years the ZAD has experimented forms of life which prefigure a possible future society in the here and now — a society freed from the grip of the logic of property, in all its forms. 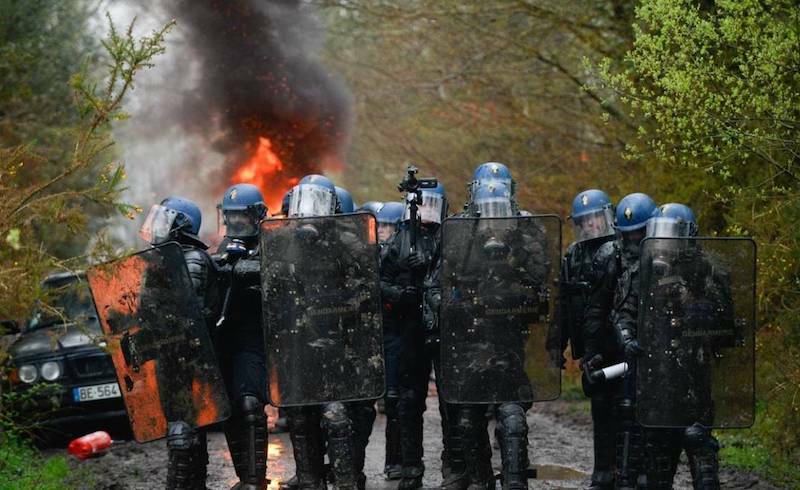 From this point of view, it is highly symbolic that the ZAD’s inhabitants and defenders proposed from the outset that the Assembly on the use of the land should take charge of collectively managing the spaces and the soil at the ZAD. This solution had the advantage of directly extending the experience that has already been begun and pursued across so many years: allowing the logic of common use, a logic of care and maintenance, to prevail over the logic of property, which is a destructive, deadly logic. The prime minister says that the state is defending the rule of law. But what is really happening is that a state based on the rule of force wants to eliminate, as quickly and totally as possible, everything that corresponds to the principle of the commons in action: associations, consumer and producer coops, agricultural and artisanal projects, and convivial modes of life and exchange. Through its excessive police measures, the state seeks to prevent a real innovation in how we produce and live together. It wants to wipe out a model for the collective, ecological life which is today so necessary. The state appears for what it is. It is not simply the guarantor of private property; rather, it is itself subject to the logic of property, from top to bottom. It is a property-state, at war against the commons. We have to defeat this offensive at whatever cost and preserve the treasured commons that is today under threat.